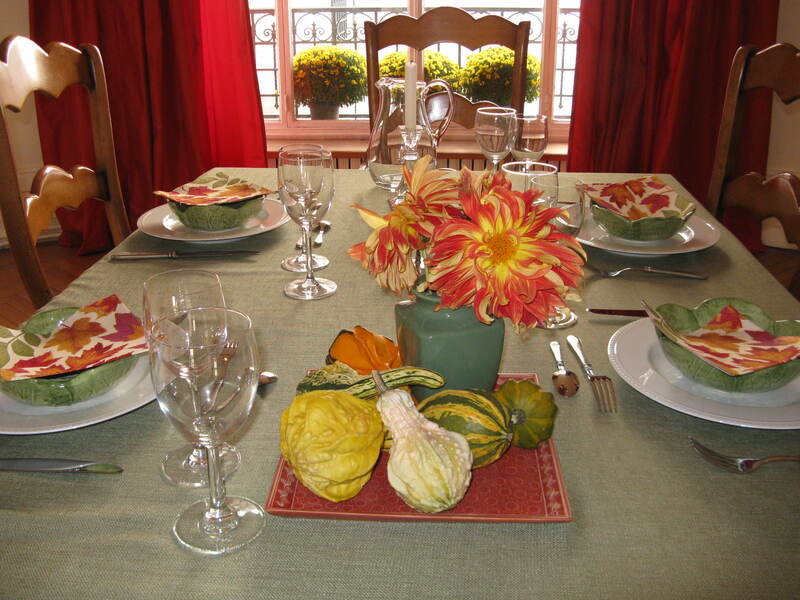 Mary Kay Bosshart, intrepid adventurer of Paris and author of the blog Out and About in Paris, recently posted her suggestions for Americans seeking a Thanksgiving dining experience in Paris. She graciously allowed us to repost here. When I was a child, my mother and father would ceremoniously gather our family of seven in the living room a couple of weeks before Thanksgiving Day. One by one, we were asked to name our favorite holiday dishes while my mother meticulously transcribed the menu onto a sheet of paper. My older brothers and sisters, who always seemed to go first, enthusiastically called out the star attractions: turkey, stuffing, mashed potatoes and pumpkin pie. When my turn finally came, only the uninteresting dishes, like “relish plate” or “scalloped corn”, seemed to be left. Nonetheless, Thanksgiving has always been one of my favorite holidays. It’s a day for families. A time when we pause to give thanks for all of our blessings. If, like me, you’re going to be far from your loved ones on Thanksgiving Day, here are some ideas for where to celebrate this American holiday in Paris. Breakfast in America: This American diner is offering two seatings of a traditional dinner that includes an aperitif, a starter, turkey plate with gravy, stuffing, mashed potatoes, sweet potatoes, vegetable, cranberry sauce and a slice of pumpkin, apple or pecan pie for €32.95. Wine, alcohol and other drinks are not included in the price. Reservations via email required: bia.thanksgiving@gmail.com. Breakfast in America, 17, rue des Ecoles, 75005 Paris. Ralph’s: Ralph Lauren’s namesake restaurant in its flagship boutique in St Germain des Prés celebrates Thanksgiving in true American tradition with the season’s most festive dishes including turkey, stuffing, apple pie and more for €120 per person. Call Ralph’s at +33 (0)1 44 77 76 00 to make reservations. The two seatings (6:30 and 9:00 pm) are sure to fill up fast. Meetup’s “The Paris Thanksgiving Dinner”: Mainly for expats who live in Paris, Meetup’s traditional Thanksgiving dinner will be between €37 and €40, including a glass of wine. A short, digestive, slow-paced, post-meal walk to Sacré-Cœur will follow the meal. Join Meetup and reserve online. Whether you’re on your own or in a group, I highly recommend Le Foodist’s “Cook and Dine”. After a glass of champagne, you’ll hone your cooking skills for two hours and then sit down to a five-course meal while your host shares wine, stories and images to explain how all the dishes relate to the local culture. It’s Thanksgiving with a French twist! The all-inclusive evening is €130. Reserve online. Le Foodist, 59 Rue Cardinal Lemoine, 75005 Paris. Tel: +33 (0)6 71 70 95 22. Alternatively, we thoroughly enjoyed stuffing ourselves with delicious Basque food at Chez L’Ami Jean two years ago. Here’s a blog post from the archives with more information. You’ll find all the essential ingredients to make your own holiday dinner at the aptly named Thanksgiving and The Real McCoy, two small American grocery stores in Paris. It’s also possible to order a roasted turkey from your local butcher. Just be sure to plan ahead and order it about three weeks in advance. EDITOR’S NOTE: For those of you who will be cooking, take a look at our post on American groceries if you’re missing that special something. You might be surprised, however, what you can find in Paris without going too far from home. Supermarket pain de mie works fine for your stuffing (just leave it out on the counter over night to get it good and stale) and markets catering to the West African community almost always have sweet potatoes. Cook up some potimarron for your pumpkin pie. Cranberries can also be found in open-air markets but be prepared to pay an arm and a leg for them. And make sure that turkey you ordered will fit in your oven. Bon appetit! Best wishes to all expatriates and visitors for a very special Thanksgiving holiday in Paris! Thank you for sharing my article.